With today’s global market, the industrialised world has developed international standards to ensure that retrofitting of aftermarket machine parts can be easily achieved, regardless of where in the world the part originated. Although in Australia there are manufacturing standards for conveyor rollers, the increase in imported machinery means that it is almost impossible for machinery operators to stick to even local standards. Imported machinery can lead to expensive roller replacement, as rollers are often sold as a “machine spare part” and not just a standard conveyor roller. To reduce their maintenance costs, conveyor operators then turn to the local market for spares such as conveyor rollers and this is where problems can occur. To the untrained, a small variation in the length or diameter of a conveyor roller may seem insignificant, but the effect of installing the wrong size roller can ultimately be quite devastating structurally and costly to operations. Incorrect belt tracking can result in supports getting butchered in an attempt to make a roller fit. For nearly 3 decades, bulk materials handling supplier Kinder & Co has focused on solving conveyor issues. Neil Kinder, CEO of Kinder, explained that “if correctly done, modifying the roller supports to accommodate the length of the roller may allow the new roller to be installed and operate properly. But what happens the next time this roller is replaced? If the same part isn’t supplied, a sloppy or incorrect fit may result in incorrect belt tracking and other potentially major high maintenance problems". “Whereas correctly specified conveyor rollers will minimise downtime, reduce maintenance labour costs and reduce the often hidden additional costs associated with lost product. Also, correctly specifying conveyor rollers means more than just supplying “rough measurements”. Providing an accurately measured roller length to a supplier can be the difference between a quick installation and a long maintenance shut down and this difference in operational efficiency can be measured in financial terms. 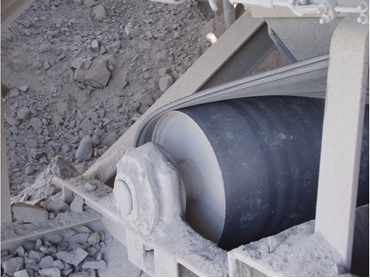 “Conveyor belt tracking is arguably one of the most common headaches for conveyor maintenance engineers and accurately specifying the correct diameter of a conveyor roller can eliminate one potential cause of this problem.